Opera has long taken inspiration from literary works, including books, poems and plays. Ahead of the world premiere of Nothing, based on a novel for young adults by Janne Teller, we look at some of the other operas with a literary origin to have premiered at Glyndebourne. Glyndebourne’s youth opera is based on a book for young adults by the Danish author Janne Teller. Often described as a modern-day Lord of the Flies, Nothing tells the haunting story of a group of teenagers trying to convince their classmate life has meaning. Things quickly escalate as the children go to ever more extreme lengths to try to persuade their friend that there are things worth caring about. The award-winning book, first published in Denmark in 2000, has been translated into many languages but has been controversial, with schools in some countries banning it because of its dark subject matter. Composer David Bruce and librettist Glyn Maxwell, the team behind the Olivier Award-nominated The Firework Maker’s Daughter, have adapted the book into an opera. 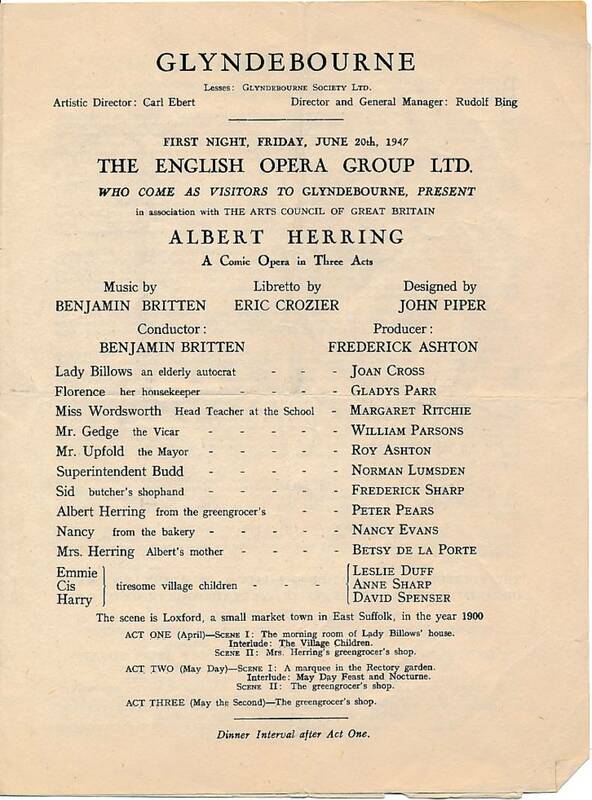 Benjamin Britten’s Albert Herring had its world premiere at Glyndebourne in 1947 in a production by the English Opera Group. The story was inspired by Guy de Maupassant’s novella Le Rosier de Madame Husson, published in 1887. The book follows the titular Madame Husson’s efforts to find a virtuous young girl to crown Rose Queen (Le Rosier). When all the young women in the town fall short, the prize goes to the village idiot who uses his winnings to go to Paris. The book has also inspired a number of film adaptations including this one from 1950 by Jean Boyer. The popular children’s book Where the Wild Things Are was adapted as an opera by Oliver Knussen with a libretto by the author himself. The opera was originally commissioned by Brussels Opera in 1978 and produced for them in an incomplete form in 1980. In 1982 London Sinfonietta gave a concert performance of a revised but still incomplete version, following which Glyndebourne commissioned the completion of the work and premiered it in a performance at the National Theatre in 1984. 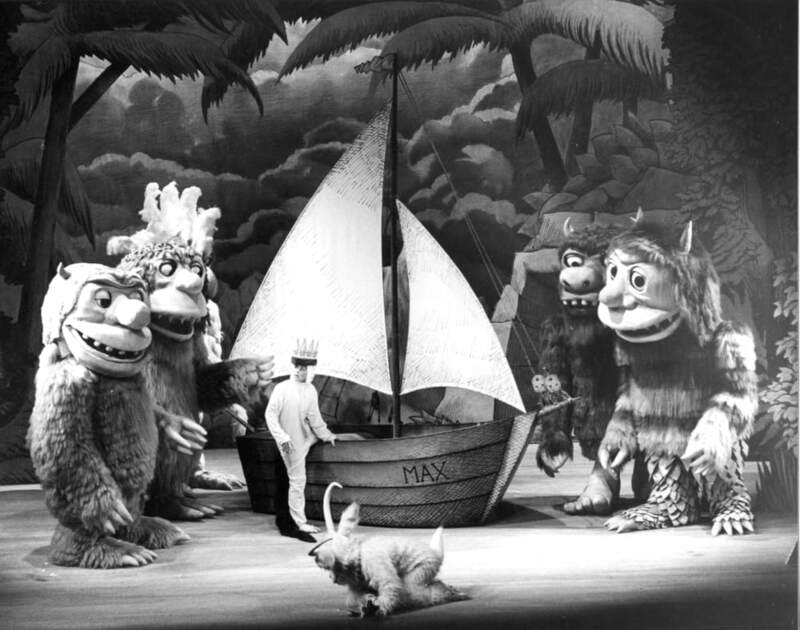 With the original picture-book story featuring only 338 words, it proved a challenge to expand the story to fit the feature-length format, so Where the Wild Things Are was performed as a double-bill with Sendak and Knussen’s other opera, Higglety Pigglety Pop! – commissioned especially for Glyndebourne around the same time. As well as writing the libretto and designing a two-dimensional picture book style set, Sendak conceived the stunning costumes. Nigel Osborne’s The Electrification of the Soviet Union draws on two autobiographical works by the Russian writer Boris Pasternak, most familiar in the west as the author of Doctor Zhivago – the novella, The Last Summer and a poem called Spectorsky. Taking its title from Lenin’s dictum ‘Communism is Soviet power plus the electrification of the whole country’, the opera focuses on a young poet called Serezha Spectorsky, a portrait of the novelist himself, who is grappling with the tensions between art and life. 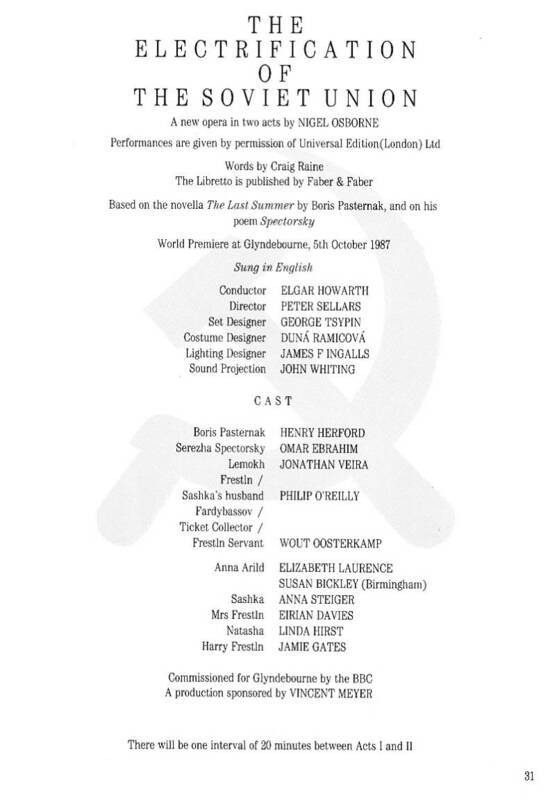 Commissioned for Glyndebourne by the BBC, The Electrification of the Soviet Union premiered as part of the 1987 Glyndebourne Tour. In 2008, with support from BBC Radio 3, Glyndebourne premiered a new opera from Peter Eötvös based on the novel Of Love and Other Demons by Gabriel García Márquez. A live recording of the opera from the 2008 Glyndebourne Festival was released on the Glyndebourne label in 2013. The author’s writing has inspired musicians from across the genres including Radiohead, Mexican singer Oscar Chavez and contemporary jazz guitarist Bill Frisell. Of Love and Other Demons, first published in 1994, tells the story of 12-year-old Sierva Maria de Todos los Angeles, who is the only survivor when a number of townspeople are bitten by a rabid dog. Suspicious of why she avoided death, some begin to fear she has been possessed and the girl is locked away in a convent. The young priest charged with exorcising her is the only person to believe in her sanity. In Márquez’s novel Eötvös felt he had found a work whose central elements – forbidden love, the restrictive hand of religion, tragic passion – were ideally suited to operatic exploration.